25000mAh power bank can charge an iPhon e 6up to 12 times, a Galaxy S6 up to 7 times or an iPad Mini 3 about two times. There is no need to worry about your battery running out.Talk to your friends, play games, or surf the internet for as long as you want. No need to find electrical outlet when you're on business travel, going camping, etc. 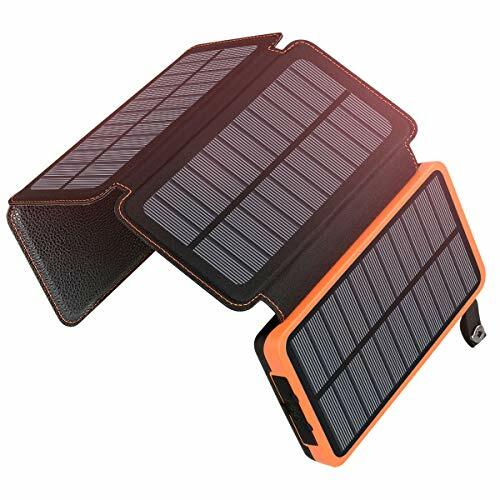 This solar power bank is compatible with almost all the 5V devices, such as iPhone, iPad, Samsung, Sony, Huawei, HTC, LG, XiaoMi, Nexus, Tablet, camera, Bluetooth, GPS etc. It can absorb more sunlight through the 4 solar panels, that means it can be recharged by the sunlight 4-5 times faster than other solar charger. Solar used as the main charging method for outdoor activity. It needs 40 hours to be fully charged by sunlight. Long press the ON/OFF button to turn on the LED flashlight. Press ON/OFF button again to turn off the LED light. Press the button again switch flash light between 3modes (steady-SOS-strobe). With 4 solar panels: The power bank can be charged more quickly than others through the 4 solar panels (25~30hs). It can be recharged with the attached micro-USB cable or a cable of your choice too. Dual USB Output: Dual 2.1A USB allow you to fast charge two devices at the same time, work with all phone/iPad/Tablets, or other electronic devices. Automatic Smart Identification, it is more convenient and practical. Safety Protection & Waterproof: Intelligent Protection System effectively prevents your devices from overcharge, over current and short circuits. Auto-stops when your device is fully charged. The waterproofing grade up to IPX6, never worry about rainy day. Warranty : We provide worry-free 12-month warranty and friendly customer service. It's a no risk purchase. If you have any problems, please feel free to contact us. If you have any questions about this product by ADDTOP, contact us by completing and submitting the form below. If you are looking for a specif part number, please include it with your message.